This free Dreamweaver extension has everything you need to create a modern CSS drop-down horizontal or vertical menu without writing a single line of code. Contemporary menu design - CSS styled unordered lists based markup. Full cross-browser compatibility - works in all currently used browsers (such as Chrome, Firefox, Edge, IE8 - IE11, Safari, Opera, etc.) and in most outdated browsers (including IE5.x - IE7), degrades gracefully in very old browsers. Valid HTML and CSS - the menu markup complies with HTML, XHTML and CSS standards and passes W3C and Dreamweaver validity checks. Multiple menus on a page - you can have as many CSS menus on a page as you like. 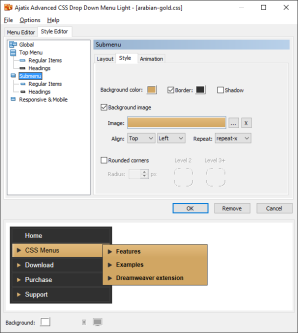 Dreamweaver templates supported - easily update your menu across the whole site by placing it into a Dreamweaver template. 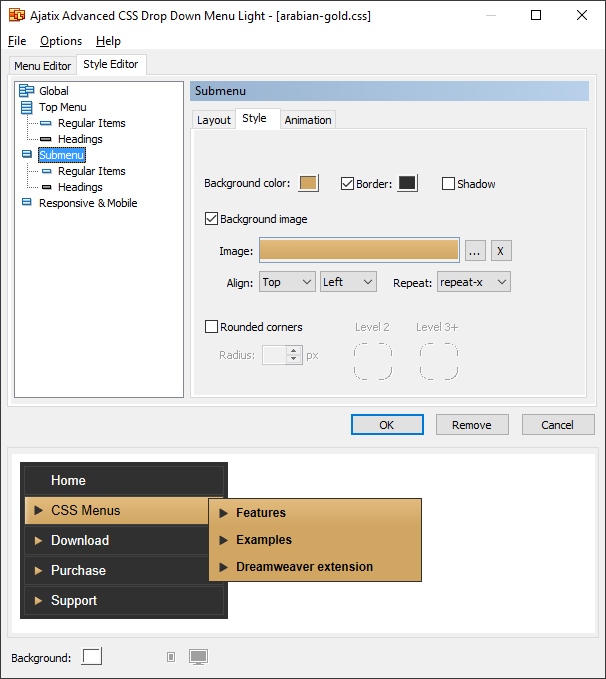 User-friendly Dreamweaver extension GUI - no need to dig into CSS files, make any change in menu style or structure with few comprehensive clicks. 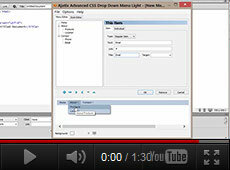 Free - The Light version of Advanced CSS Drop Down Menu is absolutely free.